Today, Prime Minister Narendra Modi has inaugurated the Netaji Subhash Chandra Bose museum at Red Fort (in Delhi) to mark the leader's 122nd birth anniversary. The museum showcases various artefacts related to Subhash Chandra Bose and Indian National Army. The Prime Minister also visited the Yaad-e-Jallian Museum, which provides an authentic account of the Jallianwala Bagh massacre (held on 13th April 1919). The museum also showcases the heroism, valour and sacrifices made by Indian soldiers during the World War-I. 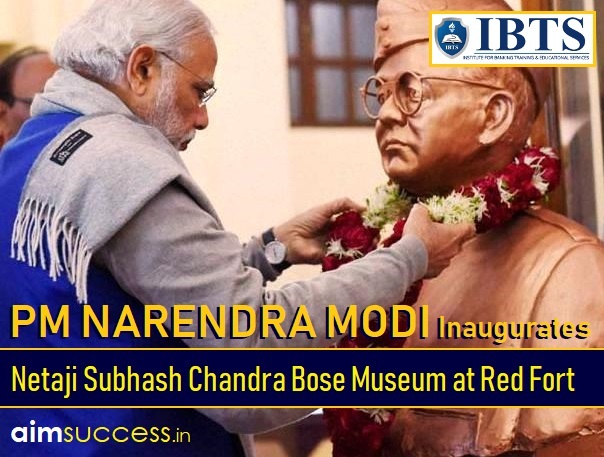 In October 2018, PM Modi laid the foundation stone of the museum during the celebration of the 75th anniversary of Azad Hind Government. Netaji Subhas Chandra Bose was an Indian revolutionary who attempted to rid India of British rule with the help of Nazi Germany and Imperial Japan. In Assam, Railway Protection Force (RPF) of Lumding Division has formally launched ‘JOYMATI BAHINI’, comprising women sub-inspector and constables of the RPF at Kamkhaya Railway Station in Guwahati. The Objective of the Joymati Bahini is to strengthen women security around Guwahati region within railway premises and trains. AYUSH Minister Shripad Naik has inaugurated the 2nd World Integrated Medicine Forum 2019 in Goa. (23rd - 25th 2019). The organizers of the forum are the Central Council for Research in Homeopathy, under the Ministry of AYUSH. International drug regulators dealing with homoeopathic/traditional medicines from various countries like France, Switzerland, Germany, Belgium, Spain, Russia, Brazil, Cuba, South Africa, Thailand, and Malaysia are expected to participate. The regulation of homoeopathic medicinal products is highly variable worldwide. The forum will explore and illustrate the potential benefits and pitfalls of bilateral and multilateral collaboration and advance global cooperation on a synergistic basis. Union Minister Nitin Gadkari laid the foundation stones of 6 Namami Gange projects in Agra and Mathura. The first is an integrated sewerage infrastructure for the city on Hybrid Annuity Mode with ‘One-City-One-Operator’ approach and reuse of treated sewage water in Mathura refinery. Rehabilitation of sewerage infrastructure and augmentation/ upgradation of STP at Vrindavan at a sanctioned cost of 33.82 crore rupees. For abatement of Industrial Pollution, there will be a project for upgradation of infrastructure of existing CETP for Textile Printing units at the Mathura Industrial Area. The projects in Agra include comprehensive Sewerage Scheme for the city with ‘One-City-One-Operator’ approach on Hybrid Annuity Mode for creating new STPs of 176 MLD, upgradation, rehabilitation of old plants and O&M for 15 years. The Chief Minister of Arunachal Pradesh ‘Pema Khandu’ has declared Pakke Paga Hornbill Festival (PPHF) as the ‘State Festival’ at Seijosa in East Kameng district at Arunachal Pradesh. Arunachal Pradesh Forest Department will fund the festival from 2020 and permanent infrastructure will be constructed for the festival ground. The PPHF festival was celebrated first time in 2015 to recognize the role played by the resident Nyishi tribe in conserving hornbills in the Pakke Tiger Reserve (PTR). Pakke Paga Hornbill Festival (PPHF) is only conservation festival of Arunachal Pradesh. Union Minister for Road Transport and Highways Nitin Gadkari dedicated to the nation Kerrian Gandyal bridge in Jammu and Kashmir. The 1.2 km long bridge has been constructed over river Ravi in Kathua district at a cost of rupees 158.84 crore. This will reduce the distance between the two cities from 45 kms to 8.6 kms and benefit over 2,20,000 people living on the two sides – Kathua (Jammu) and Pathankot(Punjab). Former India hockey player Raghbir Singh Bhola (92-years) passed away. Bhola represented India in the 1956 Melbourne (winning gold) and 1960 Rome Olympics (winning silver medals), respectively for the country. He was two-time Olympic medallist, Arjuna awardee and a passionate field hockey player. He has made outstanding contribution to hockey, as a player, umpire and team manager. Senior journalist Gopinath Kochattil (82-years) passed away at his residence in Kochi. He authored 'Njaan Kanda Europe' one of the earliest travelogues in Malayalam. Kochattil worked for several publications including Patriot, Morning Post, Hong Kong Standard, South China Morning Post and Deccan Herald. He served as the executive director of the online wing of Kerala Kaumudi. The Union government has constituted a high-power committee headed by NITI Aayog member (health) to monitor the pricing of medicines and healthcare products. The Standing Committee on Affordable Medicines and Health Products (SCAMHP) will be the recommending body to the National Pharmaceutical Pricing Authority (NPPA). The committee will also include the chief economic adviser and other policymakers. It will be tasked with recommending price controls and monitoring the prices of specific drugs and health products to ensure their affordability. The Board of Control for Cricket in India (BCCI) has announced a bonus of 20 lakh rupees each for the senior selection committee members following India's maiden Test series win in Australia. Virat Kohli led India to a historic 2-1 win in the four-Test series before capping the Australian tour with a maiden 2-1 triumph in the ODI series. Earlier, The BCCI had announced cash awards of 15 lakh rupees per match for each of the playing eleven that featured in India's maiden Test series win on Australian soil. The Indian board had also announced cash awards for all the reserve players, as well as the members of the support staff. Mohammed Shami has become the fastest Indian bowler to claim 100 ODI wickets (in the 56th match), during the ODI match against New Zealand at Napier. Earlier, India’s record held by Irfan Pathan (in 59th matches) in 2006. Currently, the World record held by the Rashid Khan (Afghanistan leg-spinner), reached the mark in just 44 ODI games.